To understand turbine pumps, also called centrifugal pumps, displacement pumps or kinetic pumps, you need to know what a turbine is and what a pump is and how the two come together. A turbine gathers energy from moving fluid, or flow, through the use of a rotary engine. A pump displaces liquid and, by doing so, moves the liquid out and to the next phase of the process the pump is used for. Turbine pumps create a high-flow rate while pumping. High pressure is created through the use of the rotor that, in turn, increases the flow of the liquid. The pressure allows the pump to pull more liquid, faster and from deeper, enclosed areas than using just a pump. To understand turbine pumps, also called centrifugal pumps, displacement pumps or kinetic pumps, you need to know what a turbine is and what a pump is and how the two come together. A turbine gathers energy from moving fluid, or flow, through the use of a rotary engine. A pump displaces liquid and, by doing so, moves the liquid out and to the next phase of the process the pump is used for. Turbine pumps create a high-flow rate while pumping. High pressure is created through the use of the rotor that, in turn, increases the flow of the liquid. 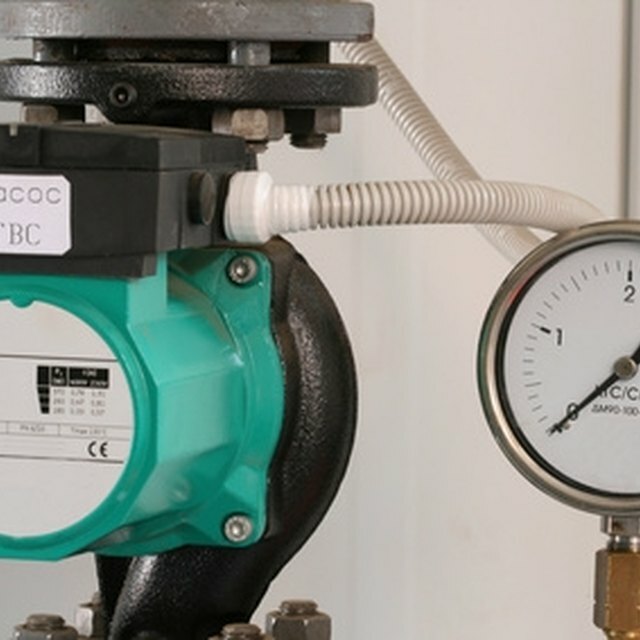 The pressure allows the pump to pull more liquid, faster and from deeper, enclosed areas than using just a pump. In reality, a turbine pump is not a turbine in that it is not extracting energy from a liquid. Instead, the turbine engine drives the pump. This causes the pump to be able to work at high speeds. An example of a turbine pump, or turbopump, are the engines used by the Space Shuttle. These are turbopumps that supply the fuel into the combustion chamber of the engines. Turbine pumps come in two different types: axial or centrifugal. Axial turbine pumps are used to raise the pressure of a liquid. Centrifugal turbine pumps are used to propel fluid out and away, usually on to the next step in a system. The most common type of turbine pump is a centrifugal pump. The liquid to be pumped enters into the chamber at its center and is sent through the rotary motion of its wheel or disc. This throws the liquid to the rim or exterior of the chamber. The liquid then makes its way through a diffuser, which turns the energy created by the spinning movement into pressure sending the liquid out of the chamber at high flow rates. Centrifugal turbine pumps can pump water and expel it at high pressures. It should be no surprise that this turbine pump was originally developed for fire fighting. Axial turbine pumps consist of a series of propellers or blades along a shaft. The blades are alternate as either static or rotating. Instead of the single disc motion and high speeds of the centrifugal pump, the axial delivers much lower pressures and less speed. This type of pump builds pressure progressively. Axial turbine pumps are sometimes used in conjunction with a centrifugal pump.